To say that the pipe that is the subject of this article is weird is, for once, an understatement. It could be described as strange, but I find it quite simply overwhelming. It defies all forms that I know of and it is a masterpiece of ergonomic work. Its author is Japanese. Okamura Yukio (uses SACI as his brand name) is a homo ludens (“happy man”) as he prefers to be called. 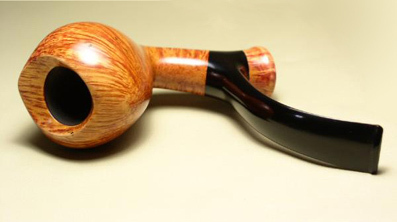 He started making pipes in 2000. 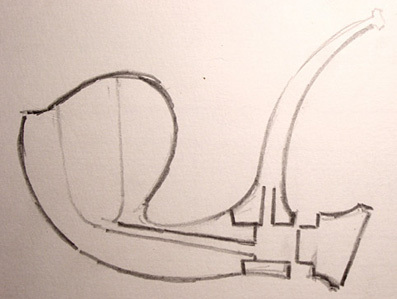 It is rare to be able to access the design stage of a pipe, the unique moment of the emergence of an idea. So we appreciate this design sketch that Yukio Okamura was kind enough to send me. It is a bit like visiting the scenes of a theater, as if we had access to backstage after seeing the room. In terms of form, I really do not see a real connection to the known classifications. Of course it has some characteristics of a "Cavalier" . The airway of the pipe is perpendicular to the stem, certainly. But the bore of the head is conventional. 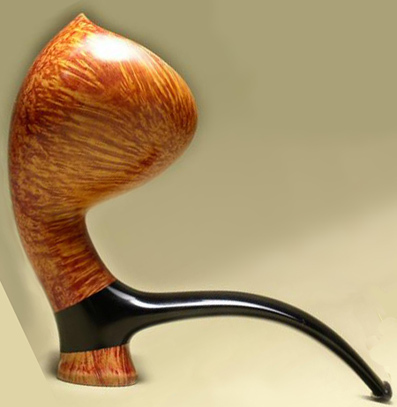 We must resign ourselves: this pipe is unclassifiable so its design is innovative. It could at most daring comparison with that pipe contained in the article entitled "Sink siphon" ("Siphon de lavabo"). There we find, on closer look, the same elements. But the resemblance stops there, of course! Judge for yourself the ability of this artist to integrate the different parts finding solutions of continuity to form a coherent whole. The junction between shank and stem is remarkable. 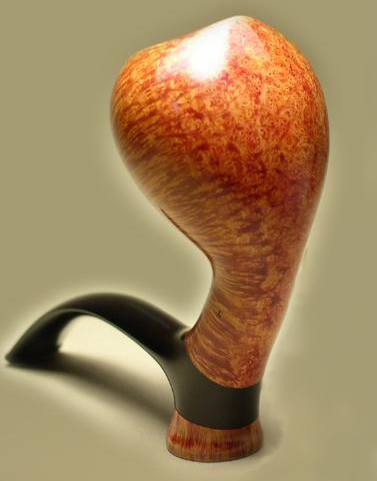 All this has a harmony and each element of this pipe, in its form as in its position, has utility and meaning. Finally, there is the possibility of enjoying the pose of the seat created by the natural continuation of the stem on the one hand and the button on the other. Unheard of to my knowledge. 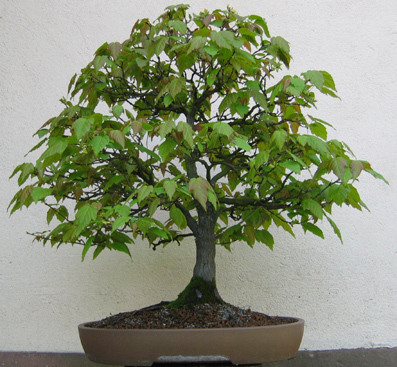 As with all Japanese pipes cited in these columns, I propose to accompany each with one of my bonsai collection. This time it is a Siberian maple (Acer ginnala) which, despite its name, is well acclimatized to our latitudes and you'll find it in our parks. It is sometimes also called: Amur Maple. ◄ Amur maple in spring.